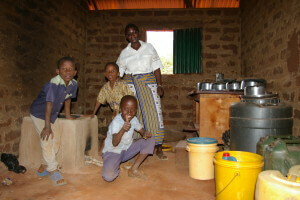 The project consists in improving Cook Stoves used by the Shimba Hills community. The project distributes 11.100 Cook Stoves for free to families in the community. Delivered Cook Stoves are tracked by GPS and can be viewed with Google Earth. With the purchase of 500 carbon credits, 145 Cook Stoves are financed, which benefit 145 families, impacting positively 652 people and 435 children. 378 kg of wood are saved and there is a likely reduction of 101 people to contract diseases related to the smoke inhalation. In addition the project gives support to social projects, like the Muhaka Secondary School. Reduction of CO2 emissions, due to the use of high energy efficiency Cook Stoves. Protection of the forested zones close to the project area, as the forest exploitation to obtain wood for cooking is reduced. Reduction of local air pollution, due to a decrease in the amount of smoke generated with the new Cook Stoves. Improvement of the quality of life of the community women, as they have more time to take care of the children and for schooling them. This is because the amount of wood to be collected daily as well as the time needed for cooking is reduced. Health improvement, as the illnesses related to the smoke inhalation are reduced. Contributions to the local economy, as the Cook Stoves are manufactured in Kenya. Provision of a new kitchen and large Cook Stoves to the Muhaka Secondary High School. Poverty reduction, as the efficient wood Cook Stoves reduces the annual inversion in fuels.